This week employment news arrived in with 2000+ job posts under various sectors. Railways, Ministry of Finance, Ordnance factory, DU, UPSC and other major organizations are included in the list. 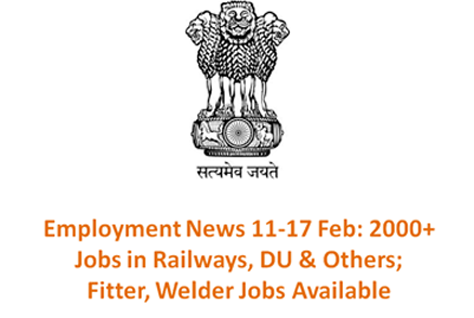 Employment news for the week Feb 11- 17 has some major vacancies under renowned government organizations. Around 2000+ jobs are available for candidates to apply under various sectors. Jobs are available for Semi Skilled, Accts Officer, Engg Asst, Clerk, Teaching and others. The recruitment processes for many important notifications have started and candidates who fulfill the eligibility criteria can easily apply for those job posts. Jobs are issued for secondary, senior secondary, graduates, post graduates and others. Ministry of Finance has issued the major notification to hire 643 Assistant Accounts Officers along with Railways and Ordnance Factory Medak. Railways will fill above 200 posts in two regions of the country- North Central Railways and South Western Railway. Ordnance factory will appoint 370 Electrical, Fitter, Machinist, Welder posts. Willing candidates can apply for these job vacancies through the links pasted below.